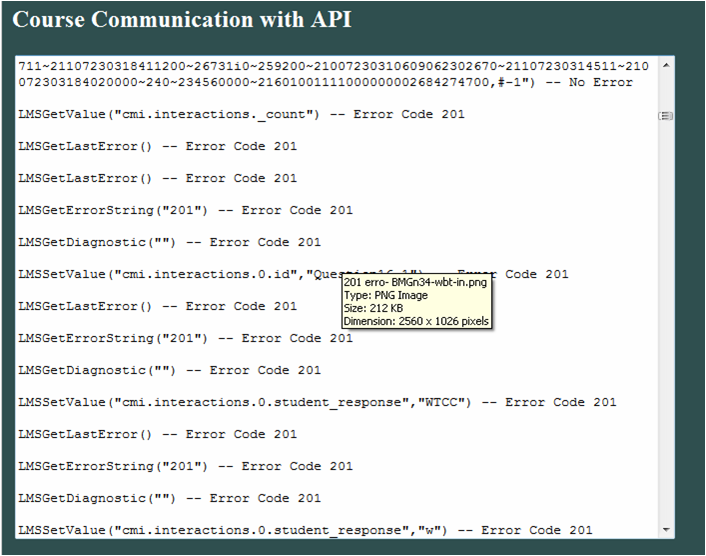 My course published in Articulate studio 09 showing the following error code 201 in my LMS. Kindly tell me the possible reasons for the above error code 201. Welcome to Heroes. Have you contacted your LMS? General Argument Error (201) An invalid argument was passed to an API method (usually indicates that Initialize, Commit or Terminate did not receive the expected empty string argument. Thank you for your expert comments! I just wanted to know the reason behind the above error (201) and how can we correct it? If we leave this error as is, whether it would effect the successful completion of this WBT or not? Is this error from development side / Articulate or from LMS end? It would be great if you could reply to this concern ASAP? I would say LMS side. Open a support ticket with them and provide your information that you provided here. Let us know here what they say and whether your issue gets solved.